Indian services sector climbed back into expansion zone in March, helped by the flow of new work, encouraging companies to hire at the fastest pace in seven years. The seasonally adjusted Nikkei India Services Business Activity Index rose to 50.3 in March from 47.8 in February. A reading of over 50 on this survey-based index indicates expansion and below that contraction. The survey showed upturn in information & communications and transport & storage negated downturns in consumer services, finance & insurance and real estate & business services. 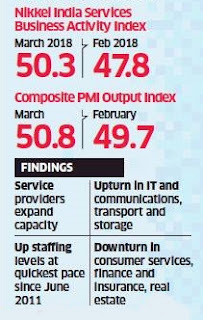 The seasonally adjusted Nikkei India Composite PMI Output Index rose from 49.7 in February to 50.8 in March, driven by growth in both manufacturing and service sectors. The index combines the PMI reading of both services and manufacturing sectors. Reflecting improved demand conditions and pressure on current resources, service providers expanded capacity by raising their staffing levels at the quickest pace since June 2011, the report said.